The Chicago Loop Alliance is offering local artists the chance to display their work around the Loop. Pop-Up Art Loop is a program that fills empty spaces downtown with free art galleries. 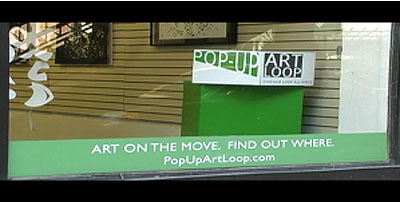 Similar “pop-up” galleries have been showcased in cities around the world, such as London, Los Angeles and New York.The Chicago Loop Alliance saw success in these cities and believed a program like Pop-Up Art Loop, could benefit Chicago in many ways. “There has been a lot of excitement from the community as well as from the artist that are a part of it and property owners can also see a benefit to it,” said Michael Perry, the Programming Project Coordinator for the Chicago Loop Alliance. Perry said Pop-Up Art started with only three pilot program galleries, but has since expanded to as many as 16 galleries on display throughout the Loop. According to Perry, Pop-Up Art Loop is funded by the Chicago Loop Alliance, making the galleries free for not only the public, but also for the participating artists and business owners. Both professional and aspiring artists can submit proposals to the program creating many levels of experience showcased in the galleries. Emily Kozik, a senior fiber and material studies student at the School of the Art Institute Chicago, explained how students may go about showcasing their work. Kozik said that often students have to set up exhibits in their apartments or basements, which can produce limited audiences. “[Pop-Up Art Loop] gives a space, it’s downtown, a lot of people frequent down here whether it’s for business or to go shopping. It’s also something you can put on your resume and have people look up,” said Kozik. Pop-Up Art Loop is assisting property owners with vacant spaces by promoting the stores through the art galleries. Most galleries are open five times a week and supervised, increasing the amount of traffic that would usually occur around vacant stores. Not only do the galleries shed positive light on the vacant spaces, they also bring traffic to surrounding businesses in the Loop. “Bike Salute” features photos of people holding their bikes upside down above their heads in a triumphant manner in parks, on the streets and beaches of Chicago. “The Pop Up Art Train” is a moving art exhibit created by various Chicago artists on an eight-car CTA train stationed at Midway airport. The train makes its artistic journey through the Loop on Saturday nights and is on display for about five hours. The pieces of art in the collection focus on expressing social justice for the community. The Pop-Up Art Train is known as “The world’s largest mobile art exhibition,” according to Pop-Up Art Loop’s web site. Richard Shipps is another artist being featured in the program. “The primary objective is exposure, to get my work in front of people, if somebody happens to like it enough that they want to spend some money, well that’s fine with me too. I’m interested in all different kinds of opportunities, and I think this gallery is a good way to get some of those things happening,” said Shipps. These three exhibits along with others can be seen at the Pop-Up Art Loop’s website. For updated information on new galleries follow Pop-Up Art Loop on Twitter and Facebook.